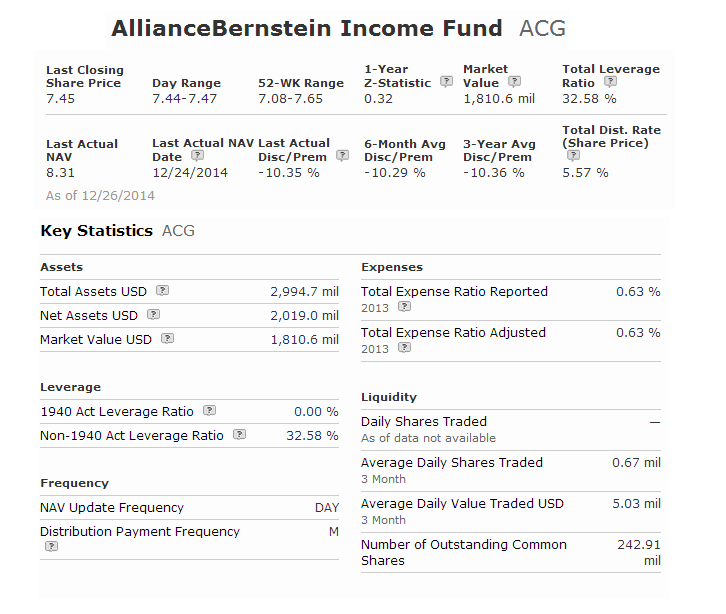 AllianceBernstein Income Fund (ACG) is an actively managed closed end fund. The fund’s objective is to provide high current income and capital appreciation. This fixed income fund utilizes its assets to purchase high yielding government and corporate fixed income securities. AllianceBernstein Income Fund managed by Paul J. DeNoon, Gershon Distenfeld, Doug Peebles, and Kewjin Yuoh. This popular closed end fund has a high yield of 5.57%. This taxable bond fund has total annual expense ratio fee of 0.62% (including interest expense of 0.06%). The fund sponsor is Alliance Bernstein L.P. The current share price is $7.45. This ACG fund has 358 holdings in its portfolio. The annual portfolio turnover rate is 107.0%. The top 4 asset allocations are government bonds (70%), high yield corporate bonds (9%), asset backed bonds, and investment grade corporate bonds. Top 5 bond sectors are U.S. Treasuries debt, corporate high yield debt, investment grade corporate debt, and agency debt. This AllianceBernstein Income Fund has been consistent in term of performance. It has a high yield for income.